Located in Allentown, Pennsylvania, the Da Vinci Science Center is a nonprofit science museum that offers a variety of hands-on interactive exhibits focusing on STEM education for young visitors. The vision for the Da Vinci Science Center stemmed out of Lehigh University’s 1989 partnership with Bob Ballard, famed for his explorations of the remains of the RMS Titanic. With support from the Junior League of the Lehigh Valley and the Bethlehem Junior Women’s Club, Ballard hosted broadcasts for his JASON Project at the university beginning in April of 1990. In 1992, the Science Model Area Resource Team Center was formed as part of the JASON Project, in an effort to bring interactive science education experiences to students. The success of the Center’s 1994 Discovery Expo science festival served as the catalyst for the Center to open a public museum facility the following year, housed within the city’s former SouthSide Bethlehem Steel Corporation building. In 1997, the Center was rebranded as the Discovery Center of Science and Technology, which broke away from the university and became an independent nonprofit organization in 1999. In 2003, the Center merged with the Leonardo da Vinci’s Horse organization, rebranding again as the Da Vinci Science Center. In 2005, the Center moved into a 29,000-square-foot location in Allentown, leased through an agreement with the city’s Cedar Crest College. Today, the Da Vinci Science Center has earned a national reputation among STEM-focused visitor museums and science centers, offering a variety of public exhibits geared toward engaging children and youth in learning about science and technology concepts through creative, hands-on activities. The Center’s educational outreach programming has been recognized nationally, including its award-winning STEM Valley Mentoring Coalition program, which was one of three 2014 recipients of the US2020 City Competition’s national grand prize. The Center’s Greater Allentown Math Science Partnership professional development program has also been ranked as one of the best programs of its kind in the country, and the Center’s leadership directors have been the recipient of awards such as the National Science Teachers Association’s Distinguished Informal Science Educator Award. Exhibits at the Center include the PPL Electric Utilities Energy Zone, a partnership with the PPL Corporation to teach visitors about the principles of electrical energy. 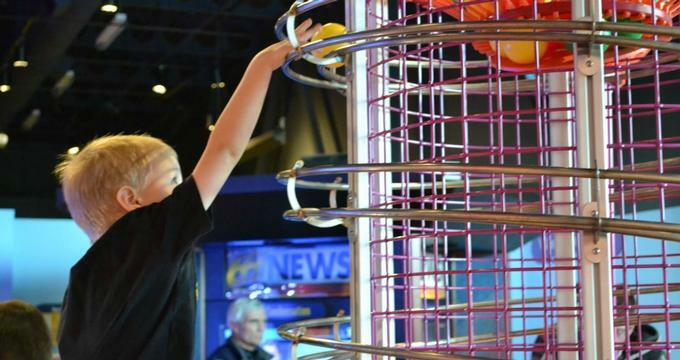 The Center’s popular Tunnel Vision exhibit offers a 72-foot tunnel maze emphasizing physics and coordination principles, while a Newton Chairs exhibit teaches about Newton’s laws of motion. Other physics-related exhibits include a Pulley Power leverage and simple machines exhibit, a High Flyers paper rocket launch station, and a Wave Power exhibit demonstrating the principles of kinetic energy through water play. Nanotechnology is also introduced through the Center’s Nano Exhibits. Human biology concepts are introduced as part of the Center’s Pin Wall exhibit, while natural phenomena are explored via the Hurricane Simulator and Quakes and Shakes Seismometer. Several large natural history focused exhibits are also showcased, including a 560-gallen Marine Tank stocked with a variety of aquatic wildlife and a T-Rexroth Robotic Dinosaur, which uses the same hydraulic technology principles as many similar amusement park attractions. At the Deer Park Water Table, young children can explore water play principles through a variety of moving parts and toys, while the Engineers on a Roll exhibit introduces STEM principles to the museum’s youngest visitors. A variety of exhibits also focus on principles of creativity and free play, such as the KEVA Build It Up station, which encourages engineering creativity through the use of KEVA plank toys. An Animation Station allows children to create their own stop-motion animations with still frame images, while a Built Like a Mack Truck exhibit offers climb-aboard experiences and simulator game play challenges. A variety of art exhibits throughout the Center emphasize the technological and artistic achievements of Leonardo da Vinci. The Da Vinci Science Center offers a wide variety of educational programming for visitors and school groups, including daily hands-on workshops and live demonstrations for museum visitors. Curriculum-incorporated field trips for elementary school students are offered, as well as day programs and camps for scouting groups. Afterschool clubs, weeklong summer camps, and single-day holiday break camps are also offered, along with Career Exploration Days events for older students introducing career possibilities in the STEM world. Little Learner Activities groups meet weekly for children ages 2-6, and periodic professional development events and workshops are offered for Pennsylvania educators. The museum is a partner organization with a number of area community and educational organizations, including Toys for Tots, the Women in Science Network, Lehigh Valley FAST, the STEM Valley Mentoring Coalition, and Dream It Do It PA.